This is an unabridged reading of Terrance Dicks’s novelisation of the 1971 six-part serial by Don Houghton. It’s one of Dicks’s better works, from a point in time (1985) when he wasn’t churning out novelisations at a rate of almost one a month. He doesn’t alter the story very much, though he does develop some of the characters, such as Sergeant Benton, who likes to imagine he is James Bond when he ventures out into the field on a (disastrous) covert mission, and Professor Kettering, who is won over but confused by the hypnotic hold that ‘Keller’ has over him. The grim and gritty subject matter of The Mind of Evil (there was always a dark side to Houghton’s writing), which includes discussions about capital punishment, phobias that are straight out of Room 101, and the involvement of dangerous criminals, is reflected in the tone of the prose. It opens with a sobering description of less civilised times in the history of the prison system, effectively comparing the executions of old with the death of personality that awaits the hardened convict Barnham. Dicks tightens up the plotting of the later episodes, so we are over halfway through the novelisation before we get to any material from the final three episodes. However, he can’t do anything to remedy the shortcomings of the Master’s elaborate scheme, which is decidedly convoluted and reliant on coincidence. 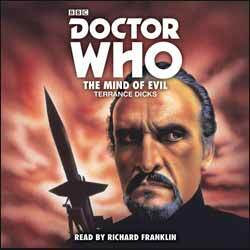 The audio book is read by Richard Franklin, who probably knows the story like the back of his hand by now, having appeared in the original television serial (as Captain Mike Yates, of course) and narrated the audio drama soundtrack of the same. He has thankfully toned down his sometimes insulting impersonations of Jon Pertwee’s lisping Doctor and John Levene’s country bumpkin Benton. Nor does he embarrass us with any offensive accents for the Chinese characters, and he is particularly good at voicing the homicidal criminal Mailer. Franklin’s reading is suitably grave during the aforementioned opening sequence, and he gets very excited during the tale’s dramatic highs. The listener cannot help but be carried along by his enthusiasm. Together Dicks and Franklin, like the Master and Mailer, make us their prisoner.